BRIGHTON, Mich. - The 2013 4th annual Brighton AutoFest is back and is sure to be a great time! 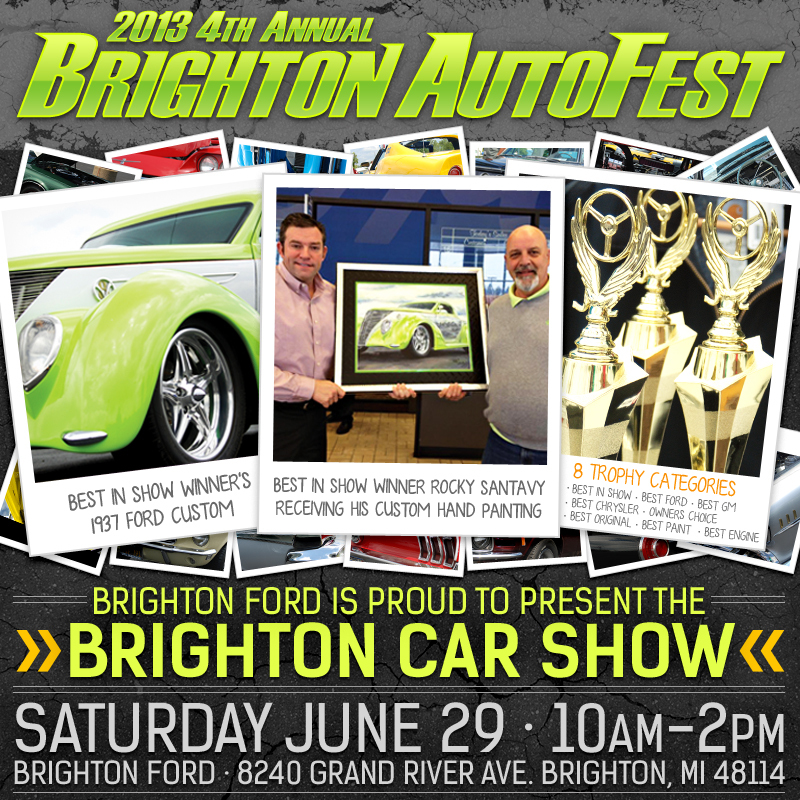 Brighton Ford will be hosting the 2013 Brighton AutoFest Car Show on June 29th from 10am-2pm. This car show will take place in the Brighton Ford lot at 8240 Grand River Ave. Brighton, MI 48114. The 2013 4th annual Brighton AutoFest is always a fun and exciting event. This year, we will have 8 trophy categories: Best in Show, Best Ford, Best GM, Best Chrysler, Owner's Choice, Best Original, Best Paint, and Best Engine! So come on out and see what amazing vehicles from the community will be on display, or bring your own ride and show it off! This year along with the AutoFest, we will be cleaning house and putting on the first Brighton Ford Premium Garage Sale! After being in business for 25 years, we've accumulated a variety of car parts, tools, home items, office items, tires, and more. The garage sale will coincide with the AutoFest on June 29th from 10am-2pm, so come check out our amazing deals! It is sure to be an exciting time this Saturday, so make sure to stop by and see what amazing things are happening at Brighton Ford! We are always available to assist you with Used Car Loans or Used Car Values at our South Lyon Area Ford Dealer. Brighton Ford is located at 8240 Grand River Ave. just north of I-96 in Brighton. We are a family owned and operated business that is committed to customer satisfaction. For more information on Brighton Ford visit BrightonFord.com or give us a call at (800) 836-8206.